If you purchase an aircraft and intend to operate in the National Air Space, you must register the aircraft with the Aircraft Registration Branch (AFS-750). Aircraft may be registered under a Certificate of Aircraft Registration or Dealer’s Aircraft Registration Certificate issued by AFS-750. CAUTION: The application must be submitted in the name of the owner(s), not in the name of the bank or other mortgage holder. You may confirm any required fees with AFS-750 prior to submitting any aircraft documents for processing. 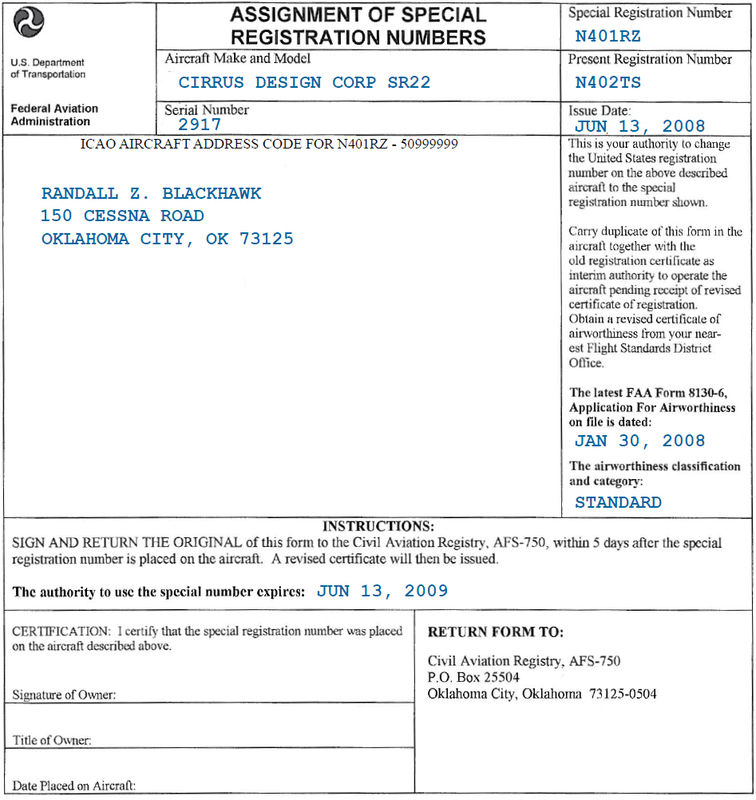 Visit the “Aircraft Registration” link on the FAA website at www.faa.gov for information regarding aircraft registration, recording liens, fees, importing and exporting aircraft, requesting special N-numbers, obtaining copies of aircraft records, downloading forms, an interactive aircraft registration database, etc. You may also order aircraft records by mail, fax, or telephone. In compliance with statutory requirements, documents are processed in date-received order. You may check to see if your documents have been received by using the FAA website “Aircraft Registration” link, and selecting the “Download the Aircraft Registration Database” link to search the document index. The FAA updates the “Aircraft Registration Inquiry” site at midnight on each federal workday. You can find new information immediately following this update. Please allow up to 20 days for processing N-number reservations and renewals and up to 30 days for all other non-priority actions. CAUTION: The act of registration is not evidence of ownership of an aircraft in any proceeding in which ownership by a particular person is in issue. The FAA does not issue any certificate of ownership or endorse any information with respect to ownership on a Certificate of Aircraft Registration. The FAA issues a Certificate of Aircraft Registration to the person who appears to be the owner on the basis of the evidence of ownership submitted with the Aircraft Registration Application, or recorded at the FAA Aircraft Registry. Failure to properly register your aircraft may invalidate insurance, as well as have other serious consequences. You may need to follow up with AFS-750 to ensure that your aircraft registration was accomplished successfully. CAUTION: An aircraft may not be registered in a foreign country during the period it is registered in the United States. The registration fee made payable to the FAA. You must use an original AC Form 8050-1 when applying for a Certificate of Aircraft Registration. AC 8050-1 may be obtained from AFS-750 or your local FAA Flight Standards District Office (FSDO). If you use a P.O. Box as a mailing address, you must also provide your street or physical location on the application. CAUTION: The FAA does not accept photocopies or alternate formats of AC 8050-1. Your application for aircraft registration must include the typed or printed name of each applicant with his or her signature in the signature block. CAUTION: An aircraft may be registered only by and in the legal name of its owner. CAUTION: The FAA will return any applications that do not include the printed or typed name of the signer. 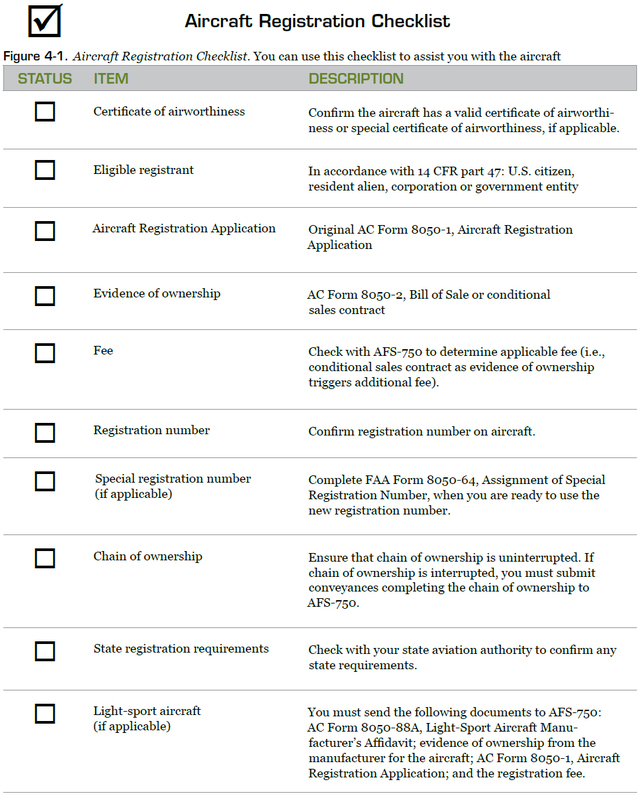 Figure 4-1 is an aircraft registration checklist you can use to assist you in the registration process. The United States received the “N” as its nationality designator under the International Air Navigation Convention, held in 1919. One to three numbers followed by two letters (N123AZ). To avoid confusion with the numbers one and zero, the letters I and O are not used. Also, please note that a hyphen (-) is no longer used in U.S. registration numbers. An N-number may not begin with zero. You must precede the first zero in an N-number with any number 1 through 9. For example, N01Z is not valid. Registration numbers N1 through N99 are strictly reserved for FAA internal use. A special registration number is an N-number of your choice which may be reserved, if available. Used to change the N-number currently on your aircraft. Assigned to a new home-built, import, or newly manufactured aircraft in preparation for registering that aircraft. Reserved for 1 year. Upon reservation, the FAA will mail a confirmation notice to the requester. A renewal notice will also be sent prior to the expiration date. An online reservation request program is available on the FAA website at www.faa.gov. Renewed annually. The renewal fee is $10 each year. An online renewal program is available on the FAA website at www.faa.gov. You may reserve a special N-number from the List of Available N-numbers for immediate use on a specific aircraft or for future use. This number may not exceed five characters in addition to the prefix letter “N.” All five characters may be numbers (N11111) or four numbers and one suffix letter (N1000A), or one to three numbers and/or two suffix letters may be used (N100AA). In your written request, list up to five numbers in order of preference in the event your first choice is not available, and include the fee. The fee for a Special Registration Number is $10.00. Forward your request to AFS-750. If your request is approved, you will be notified that the number has been reserved for 1 year, and that the reservation may be extended on an annual basis for a $10 renewal fee. When you are ready to place the number on your aircraft, you should request permission by forwarding a complete description of the aircraft to AFS-750. Permission to place the special number on your aircraft is given on AC Form 8050-64, Assignment of Special Registration Numbers. When the number is placed on your aircraft, sign and return the original AC Form 8050-64 to AFS-750 within 5 days. Figure 4-2 is a sample AC Form 8050-64. Figure 4-2. AC Form 8050-64, Assignment of Special Registration Numbers. The FAA issues AC Form 8050-64 to give you permission to place your reserved special registration number on your aircraft. You should place the special registration number on your aircraft, and then notify the FAA in accordance with the instructions provided. A duplicate AC Form 8050-64, together with your airworthiness certificate, should be presented to an aviation safety inspector (ASI) from your local FSDO within 10 days from placing the new registration number on your aircraft. The ASI will issue a revised airworthiness certificate showing the new registration number. The old registration certificate and the duplicate AC Form 8050-64 should be carried in the aircraft until the new Certificate of Registration is received, in accordance with 14 CFR part 91, section 91.203(a)(1).